Although my travels got off to a less-than-ideal start with exceptionally heavy traffic to the San Francisco Airport (it took over 2 1/2 hours to get there), everything went smoothly from SFO to Santiago Chile. The flights were on time and I managed to get some sleep on the overnight flight to Chile. I was surprised to see on the map that we flew almost directly over Havana Cuba. Upon arrival, my luggage appeared quickly, I purchased a ticket for the taxi ride, got some cash from the ATM and had a pleasant taxi ride to the Hotel Bidasoa. To my great surprise and satisfaction, my room was ready at 10:30 in the morning when I arrived. All in all, it was probably my best international arrival experience ever, with no hitches. 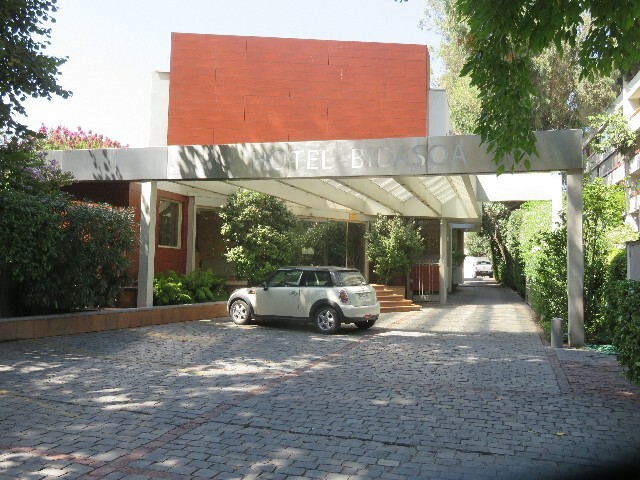 The hotel is situated a little distance from the center of the City in a very pleasant district with tree-lined streets, lots of parks, shopping and restaurants. 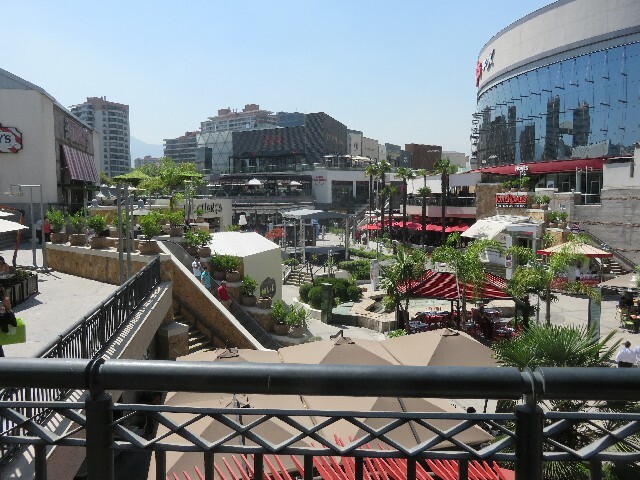 So, I did a little exploring on foot today, including a visit to a huge shopping mall. I avoided the many American chains (TGI Fridays, Tony Roma's, PF Chiang, Starbucks, etc) and ate lunch a bustling Chilean restaurant ("Tip y Tap") where I had a steak sandwich so loaded with Guacamole and other fixings that I had to eat it with a knife and fork. 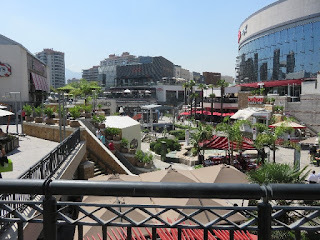 As you can see, shopping malls look the same the world over (especially in the warmer climes where there is lots of al fresco dining and lots of gelato shops). My guide book recommended the Museo de la Moda (fashion museum) which happens to be right across from my hotel. So I stopped there after lunch only to find that it is permanently closed. Next door was a bicycle shop where I had a pleasant chat (in English) with one of the staff. They did not have any distincly Chilean cycling wear, so I didn't buy anything. The tour group does not assemble until Saturday, so I will try to plan a more structured day of sightseeing for Friday, probably using the Hop-on/Hop-off Turistik tour bus. I did spend a day in Santiago in 2011 with a private guide, so I have seen most of the principal attractions, at least cursorily. The weather is fantastic -- temperature is in the eighties and not a drop of rain is forecast for the two weeks I will be here. Glad your travels have gone well. It is a nice hotel so enjoy. I look forward to following your cycling adventures. thanks for your comment Bruce. I am glad that the blog is working ok.